In fact, cancer cells must follow the same rules as all cells and there are many ways to create conditions whereby they undergo apoptosis or suicide. In fact, cancer familial syndromes are rare and very easily explained by the loss of a full gene dose of an oncogene (a protein needed to prevent cancer.) 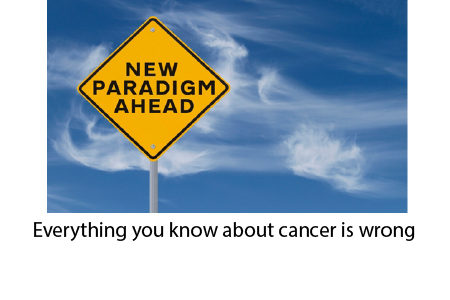 The vast majority of cancers are acquired by mutations that don’t exist in your genes. Autopsy studies of young men show that prostate cancer is common, even in the 20s, but it rarely manifests because your body’s immune system takes care of it. Lucky to survive it (if you receive chemo perhaps). There is a growing literature to suggest that chemo doesn’t fare well against non-treatment. Note: this is not a recommendation to avoid standard of care. There is no cure if it has spread. In fact, the reason we manifest more cancer in old age is because of a decline in function (numbers and potency) of our cell immune system. This example of a woman cured at the National Cancer institute with 90 million of her own immune cells proves this. Another example of a “cure” for incurable cancer is President Jimmy Carter, who cleared his metastatic brain melanoma by removing the “brakes” on his immune system that cancer cells were producing. Chemotherapy is the only way. The majority of chemotherapy types cause intentional cell mutation in rapidly dividing cells. That means a Faustian bargain as you are intentionally mutating all your healthy stem cells as well. My point is that a woman who was simply given more of her own immune cells and and elderly man who was given an antibody to block the inhibition of his killer cells, are alive and well. I suggest that telomere protection is the foundation of stopping cancer. This is because stem cells that have telomere shortening mutate and then can become cancer stem cells. Luckily, it is unlikely that the p53 cell suicide mechanism is damaged in this mutated stem cell so the vast majority of these would be cancer stem cells kill themselves. Even if there is a loss of suicide, the body’s immune system, via cytotoxic cells, takes care of the problem long before it is clinically relevant. To understand the meaning of “clinically relevant”, read the comments attached to this blog posting about a highly sensitive and specific cancer test that led to possible “unnecessary” interventions. This rather dark gallows humor misses the point. The only way to eliminate the risk of cancer is to die. Your body is capable of curing it with immune surveillance. The answer is to keep your immune system from aging and that means not letting the stem cells in your bone marrow deplete from replicative senescence, differentiation, and mutation. I refer you to this blog about a conference in which the expert on the dais said aging was the prime factor in getting cancer whereas I was accused of producing cancer with telomerase activation. The truth is in plain site. Cancer is common, fragile, curable by cell suicide or immune surveillance, and most associated with aging. 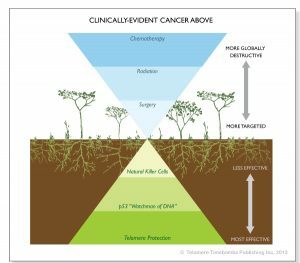 The common cause of aging and cancer is in fact telomere erosion because it is causing the acquired immune deficiency syndrome we know as growing old, with its attendant loss of immune capacity and accumulation of damaged stem cells. The question – and dilemma remains: what action of significant prevention is available to people who cannot afford current supplements targeting telemere decline? Why don’t we look at diet. The repeated research has been out there for 40, 50, 60 years.